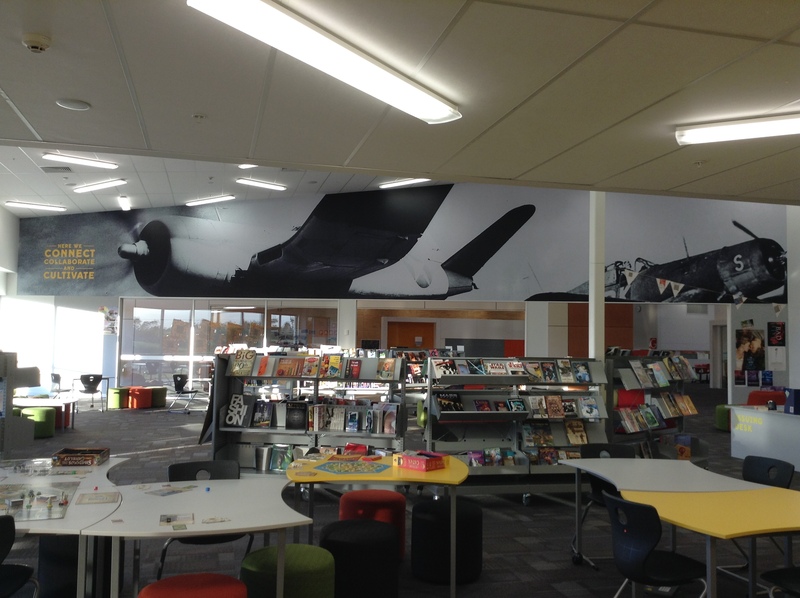 A year into my journey as the Library Leader at Hobsonville Point Secondary School, I am taking some time to reflect on where we’ve come from and where we are going next. A year ago, I was excited to be starting my new position in a Modern Learning environment. I had never worked in a library in my life and had these big picture ideas about what the library might come to be. A year on, I am astonished by the sheer extent of the learning and new knowledge that I have constructed and excited by the prospect of the vast knowledge I still have to learn. I remember feeling overwhelmed by the prospect of starting a space that I had not a clue how to run operationally. The processes and systems that are integral to make a library function as an entity within a school were not something I was clear about. I’ve discovered over the last year that a strong vision and consistent process of the three Rs (Reflection, Reiteration and Refinement) are the key to succeeding and keeping my ideas under control. A future focussed space is one that is dynamic and ever shifting in unison with the needs of it’s users. 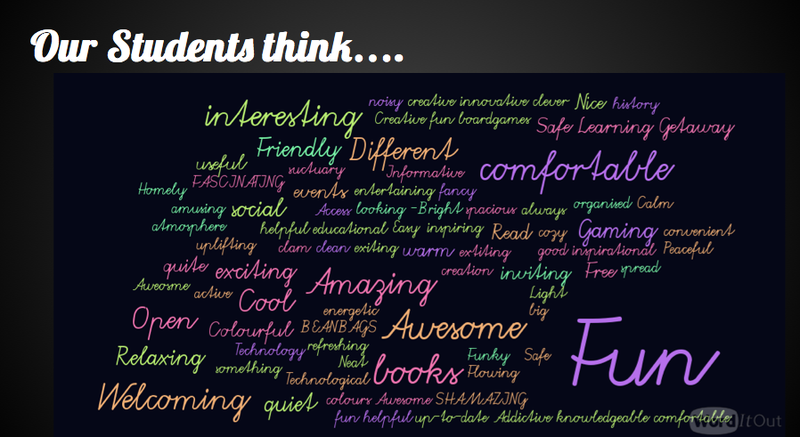 This was the key to our school vision, innovate, engage and inspire. I am an ideas-centric person and I go into ideas overload if I am under stress or pressure. My learning goal has been and still is to focus my attention on choosing the best ideas through consultation with others and learning to separate myself from my ideas to ensure that I remain objective. This is a problem we have faced this year, as the school started we were in ideas overload and wanted everything to start running as soon as possible. Term 1 and 2 felt like running on a treadmill getting our operational procedures in place, books on the shelves, forming relationships with staff and students, putting place expectations and generally learning everything I could about what a library looks, feels and sounds like. I have been lucky enough to visit a large number of libraries in Auckland, participated in professional development with more experienced and highly dynamic library leaders and have been offered support from my peers. One of our challenges in these two terms was that we wanted our staff to use our space in any way they wanted, but we found that they were unsure how it related to their subject area. We found that on our part it was a lack of promotion around what we could do for them, and a newsletter developed in Term 3 has gone a long way to alleviate this. After the first half of the year, the pressure came off the procedural and operational thinking and into how we could improve the space. Each term we undertake to complete a SWOT (strengths, weaknesses, opportunities and threats) analysis to determine our next steps. Our strengths lie in our responsiveness and relationships, our opportunities are now about creating a more dynamic space where we can make things (a 3D printer is on the wishlist), involve ourselves in creating a reading for pleasure program through the hubs (based on some of Jackie French’s work) and our threats are around time to develop these programs with the rigor that is required. I have found it absolutely vital to set aside protected time to discuss the library in an objective manner with both internal staff members and the wider community. I am looking forward to pushing more boundaries in the next year around the library as a maker space and central hub of innovation, engagement and knowledge construction. I hope that looking back in a year’s time, and I will be looking for another new iteration to put in place to make our space even better. ← Game On – How Gaming can change the ways you teach key competencies! Hi there, thanks so much for your comment. I believe that the ease with which we can access and utilise information is growing at a pace that is out dating non fiction titles about most technical subjects. This means that libraries need to shift away from being viewed as a room full of books and instead into a portal through which you can use multiple media to access information critically. The investment in libraries and in particular librarians is one that all modern learning environments need to make. In an Information Age we need specialist media and information coaches support our teachers to enable our students to leave school as critical and connected information users. I hope that goes some way to answering your question? You are right about ease, access, and current-ness. That creates quite a learning opportunity for you as a librarian doesn’t it?! How much do things like cost cutting at National Library level impact your information and other development opportunities/community? I believe that for our community, a high decile well resourced school, it is not a major issue. We build our collection based on high interest non fiction and fiction for our community as we see fit. This means smart budgeting and use of the previous national library resources. However when you consider lower decile or rural schools who do not have a high level of funding/cannot afford a librarian full time, these changes are detracting from the strength of libraries as a support system for schools. A more balanced approach would see the government investing in funding infrastructure within schools to cope with this change, including full time librarians and investment in information centres. Another opportunity would be to promote the use of our public libraries in our communities which our students will be using throughout their lives rather than being a single service model.